You can hear God’s voice every day and it’s easier than you ever imagined. He has many ways of speaking, including through the Bible, prayer, circumstances, spiritual gifts, conviction, His character, His peace, natural things, and even in times of silence. Hear all 30 chapters! 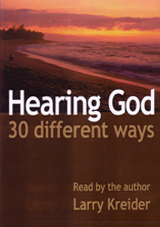 Audio book read by the author Larry Kreider. Book and Teaching Outlines available!